> Fuel Crisis… So What? With the talks of ‘fuel strikes’ to take place all over the country, we found this the perfect opportunity to promote the Nissan LEAF. With the Nissan LEAF being 100% electric, fuel buyer’s curiosity was going to be aroused. The realisation also became clear that we do rely too much on fossil fuels, and it’s not going to be in constant supply forever. While people were wasting their time, queuing up at petrol stations, I was happily driving around in my Nissan LEAF that I had charged up at work. There was something quite satisfying about driving past those packed petrol stations, knowing the only reason I would have to go anywhere near a petrol station, was just to use the shop! 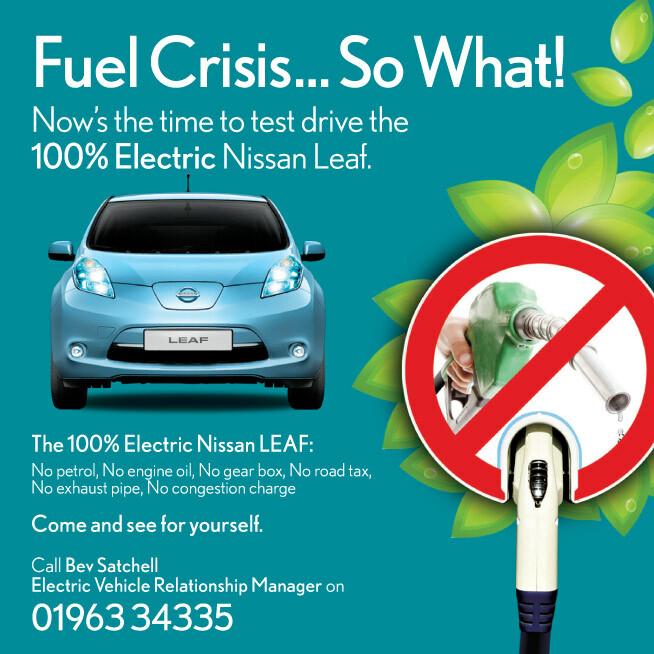 We did get more customers come in to our show room as a result, phoning up and asking for more information or to test drive the Nissan LEAF. The ‘fuel crisis…..so what?’ ad in the newspaper definitely stirred up a lot of interest. It was nice to see all the electric car doubters finally show a bit of interest. Visit our website on www.fjchalke.co.uk/eco.